1989 Artistic Director of Alexandre de Paris. 1993 Tribute to Jean Cocteau show. 1994 L’Oréal Germany tour Tribute to Jean Cocteau show. 2009 100 years of L’Oréal show. 2011 French Haute Coiffure Beijing show. 2013 50 years of L’Oréal Japan. 2014 Official Hairdresser for the Debs’ Ball for over 20 years. In 1990, Monsieur Alexandre and Michel Dervyn asked Jean-Luc Minetti to be artistic director of Alexandre de Paris. 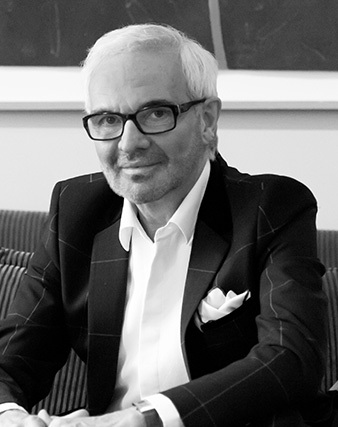 Jean-Luc gave the salon a new artistic drive while perpetuating the expertise of Alexandre de Paris. With an incomparable technique and a real feeling for creativity, Jean Luc Minetti has emerged as a benchmark in the world of hairdressing. The salon is like a laboratory researching perfection in colour, shades and love of hair. It offers tried and tested techniques, a well-developed sense of style structures and true dialogue with the customer. Jean Luc Minetti designs tailored styles with volumes that are meticulously studied and controlled. To enhance the cuts and colours, there is nothing like close attention the beauty of the hair itself, with care to give shine, detoxify, de-stress, nourish… As for colour, it is the ideal symbiosis between the art of selecting the shades with the best match and perfect mastery of the technique. This fine subtle balance gives rise to wonderful blonds, flaming reds and the most glamourous brunettes. A head of hair embellished by a successful colour is a powerful weapon of seduction..
Jean Luc Minetti cultivates the art of exception. His architectural mastery and sense of shape and outline make him the favourite expert for unique events: weddings, balls, parades. Jean Luc Minetti excels in the art of sophisticated styling. A wedding in the southern hemisphere ? A gala evening in the northern hemisphere ? He does not hesitate to send his skills out on their travels in his teams who are always ready to hop on a plane to beautify and satisfy the most demanding customers in all corners of the globe.